The report is titled "Wildfire and Invasive Plant Species in the Sagebrush Biome: Challenges that Hinder Current and Future Management and Protection - A Gap Report Update." It builds on work published in 2013 that summarized the policy, fiscal, and science challenges that land managers have encountered in conserving sagebrush, especially regarding control and reduction of the invasive annual grass/fire cycle. "The Gap Report Update has something for every level, public and private, to consider helping address the fire and invasive threat," said Virgil Moore, Director of Idaho Department of Fish and Game and director liaison of WAFWA's Sagebrush Initiative. "We encourage the leaders of the agencies and organizations working on sagebrush conservation to review the recommendations in the report and determine if there are actions they can take directly to address the gaps. It will take a broad-based coalition working together to ensure healthy sagebrush ecosystems are available for generations to come." In late-March the Wildlife Division, Department of Environment and Natural Resources, Government of the Northwest Territories petitioned membership into WAFWA. With subsequent Executive Committee approval, the agency became WAFWA?s 24th member, which now includes 19 western states, three Canadian provinces and two Canadian territories. This is a very significant and positive development. The Northwest Territories encompass 519,700 square miles of western Canada not previously represented in WAFWA - nearly twice the size of Texas and 80% the size of Alaska. It will further serve to engage another Canadian director in WAFWA on several fronts, including, wild sheep, wildlife health and endangered species. "We very much appreciate the work that WAFWA does and recognize the importance of maintaining strong collaborative networks amongst agencies faced with shared challenges," said Brett Elkins, Director of the Wildlife Division, Department of Environment and Natural Resources. Both western and eastern populations of the monarch butterfly have shown significant declines since 1997. Based on those declines, the U.S. Fish and Wildlife Service received a petition to list the monarch butterfly as threatened under the Endangered Species Act in the summer of 2014. WAFWA Directors approved the formation of the Monarch Working Group in July 2017 to identify and encourage unified, ecosystem-based management approaches at the landscape-level for the western population of the monarch butterfly, and pollinators in general, across all partner agencies. The working group includes representatives from Arizona, California, Idaho, Nevada, Oregon, Washington, and Utah. 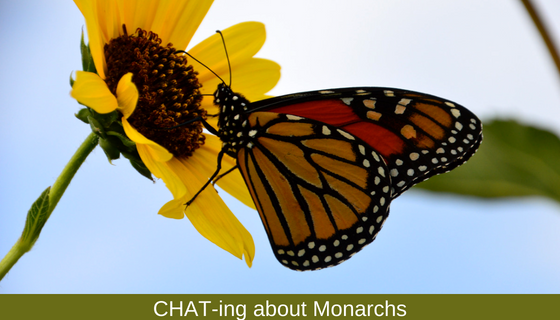 A Western Monarch Conservation Plan is being developed, which will use the Crucial Habitat Assessment Tool (CHAT) to inform its efforts. CHAT is a non-regulatory system of online maps, which presents data in a hexagon format that provides a landscape-scale perspective of habitat but does not identify specific locations or property ownership. CHAT's role on the monarch project will be to transition location-specific habitat data into the hexagon framework that identifies landscape-scale?approach to conservation efforts. CHAT will also help transition these data from static maps into an interactive web-based tool to support tracking of conservation actions for the monarch and other pollinators. 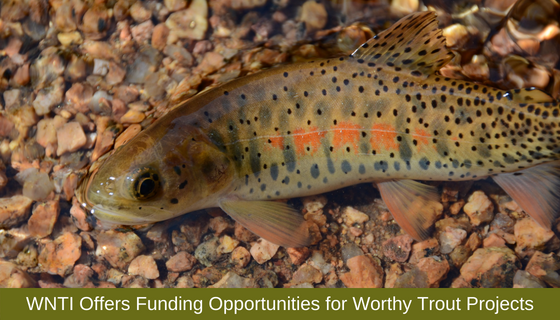 The Western Native Trout Initiative (WNTI) and its partners are once again offering opportunities for community organizations to tap into dollars to protect, restore or recover western native trout. WNTI is a WAFWA program that is a collaborative, multi-state, multi-partner effort that focusses on the conservation needs of 21 native trout species in the 12 western states where they are found. The 2018 Small Grants Program Request for Proposals (RFP) will be accepting applications until June 15, 2018. The program specifically funds innovative projects that "jump start" or complete smaller, high-impact efforts.? Individual projects can be funded at a maximum of $3,000. "These $3,000 grant awards may be a relatively small dollar figure, but they are having a big impact," said Therese Thompson, WNTI Coordinator. "Over six previous years of funding, this grant program has consistently catalyzed some of the most innovative community-based projects that are making a difference for native trout conservation across the western U.S."
The Western Native Trout Initiative (WNTI) invites you to share your catch on Instagram! Instagram is a social networking app made for sharing photos and videos from a smartphone. WNTI has a thriving Instagram feed @westernnativetrout where we share gorgeous photos of western native trout, anglers, and western waters. There are more than 6,200 followers and 420 photographs posted to date. We invite our followers to send us their photos with the native trout they encounter in the West.